It has happened to the best of us. You’ve been in an auto accident and it wasn’t your fault. And maybe you’ve been injured. During this time of the year, many weather related circumstances can cause car accidents and if we aren’t careful, very serious ones can occur. If you’ve been injured in an auto accident, through no fault of your own, perhaps you should consider hiring a personal injury lawyer in Northeast Philadelphia. Often times, we can lose out on restitution and fair compensation if we don’t have the right representation. If you are on the fence about hiring a personal injury lawyer for your accident case, read the list below. You should understand the benefits of hiring an attorney to represent you before making a decision. A personal injury lawyer has knowledge of the law, insurance company tactics and will have a previous case history that can save you a lot of time and research. They also know how to talk to the other party’s lawyer and how to get answers and results. If you try and fight the case on your own, you will be spending countless hours requesting your medical records, reviewing police reports and communicating back and forth with the insurance adjuster. The professionals at a law firm can do all of this for you. If you’ve been injured and your car is destroyed, you are no doubt hurt, frustrated and angry. Making rational decisions may not be a good alternative for you right now. Your lawyer can be your advocate and leave the emotions out of it. An experienced personal injury lawyer has years of experience learning the ins and outs of personal injury and they know the process far better than you can even learn in a short amount of time. It isn’t fair, but people who hire lawyers statistically receive more money from their injury settlement. Even after paying their lawyer’s fees, they tend to walk away with more money than they would have received without a lawyer. Hiring a personal injury lawyer in Northeast Philadelphia may be the best way to guarantee a positive outcome in your case. If your case has to go to trial, you need representation. Even if it is clearly obvious that the other party is at fault, if you aren’t represented and the defendant is, you could end up with a less than desirable outcome, just because you didn’t have the correct information or paperwork. You may not have all the info, which is why you should trust a professional who does and knows how to find it. 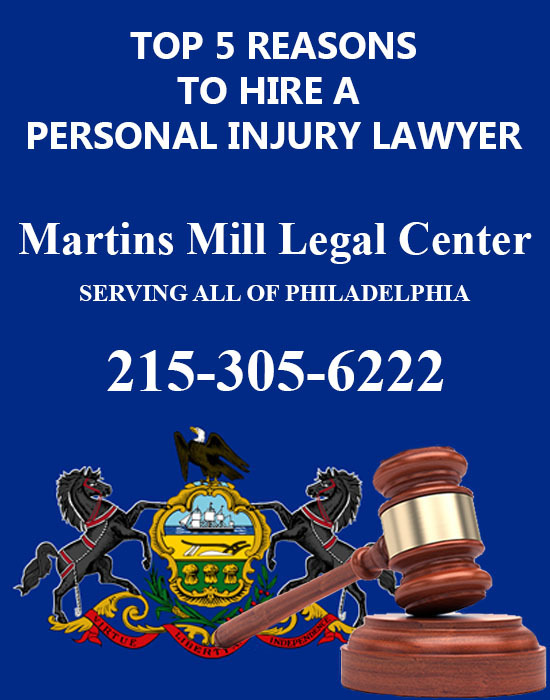 Martins Mill Legal Center is a premier personal injury law firm in Northeast Philadelphia. They specialize in client care and treat each case with personal attention. If you’ve been injured in an accident, let the team at Martins Mill help get the results you deserve from your case.